If you are exploring careers within the medical field, you may wonder what exactly is an adult health nurse? By reading the information found below, you can obtain an answer to this question and several others that pertain to this field. Although the term “adult health nurse” can be defined broadly, adult health nurses are basically nurses who provide health care services to a specific population, typically young adults, adults, and older adults (the elderly). Adult health nurses may also offer medical services to the family members of individuals who fall within the aforementioned categories. The primary objectives of the adult health nurse are to play a role in, and to help facilitate, the promotion, maintenance, supervision, and restoration of health. To accomplish these goals, the adult health nurse will often identify health risks that can precipitate disease. In many cases, adult health nurses will operate as leaders, advocates, educators, and consultants within the facilities and communities where they work. Earning a diploma in nursing was at one point the most commonly chosen path to attaining the Registered Nurse licensure and subsequently pursuing a nursing career. With this modality, the aspiring nurse will attain a diploma through a nursing school based in a hospital setting. The Associate Degree in Nursing (ADN) is one that can typically be obtained in two years. This type of degree is offered by both schools of nursing within the hospital setting as well as community colleges. The Bachelor of Science in Nursing is a four-year degree which is offered by many universities and colleges. This type of degree prepares students to operate within the full scope of professional nursing within any healthcare setting. Oftentimes, students opt to obtain the BS/BSN in order to begin their nursing careers because doing so makes one a very marketable job candidate. During the first two years of school, the student’s coursework will incorporate classes in human growth and development, microbiology, biology, nutrition, anatomy, physiology, chemistry, and psychology. During the student’s final two years of coursework, emphasis will be placed on subjects including, but not limited to, community health nursing, psychiatric/mental health nursing, pediatrics, maternal/child health, and adult acute and chronic disease. Individuals who earn the BS/BSN will typically attain a better understanding of various social, political, economic, and cultural issues that play a role in influencing the delivery of healthcare services. In placing importance on subjects such as physical and behavioral sciences, leadership, nursing theory, and the humanities, this degree helps cultivate very well-versed, knowledgeable nurses who will be capable of administering high quality care to patients from diverse populations. In many cases, individuals who become adult health nurses find that they truly enjoy working within this sector of the medical field. When this happens, the adult health nurse may opt to expand his or her education, income, and sphere of influence by becoming an adult health nurse practitioner. The adult health nurse practitioner is responsible for diagnosing and treating common health problems. To accomplish this objective, she or he will perform tasks such as completing physical examinations, conducting health histories, interpreting diagnostic procedures, and prescribing medications and/or therapy. 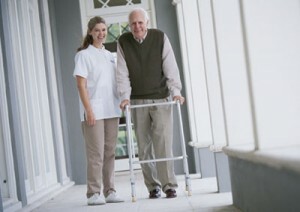 According to the Bureau of Labor Statistics, Adult Health nursing is expected to rise by 21% in the next ten years. This is much faster than the average nursing areas. If you have given any consideration to working within the medical field, you may want to consider the advantages that can result from becoming an adult health nurse. Now that you what an adult health nurse is, you can decide whether pursuing a career in this field would be appropriate or ideal for you.